The Lima group wrapped its meeting Monday with a 17-point declaration that included a call for the "national armed forces of Venezuela to demonstrate their loyalty to the interim president in his constitutional functions as their commander in chief." That call followed news on Friday that Venezuelan Air Force Gen. Francisco Yanez had switched his allegiance to Guaido and had called on his fellow officers to do the same. A second five-point statement was issued by the Lima Group nations joined by observer nations such as the U.S., which attended the Ottawa meeting. That second, shorter, statement called for a "peaceful resolution" to the crisis and the "holding of free and fair elections" but did not address the use of force as an option to deal with the Maduro regime. U.S. President Donald Trump told American media over the weekend that his administration still isn't ruling out the option of a military response to the situation in Venezuela. The group also called on the international community to act, asking the United Nations and its agencies to prepare and provide humanitarian assistance to vulnerable people in Venezuela. The group asked for international partners to halt financial and business transactions by the Maduro regime globally. The countries were also in agreement in their call for the immediate re-establishment of democracy in Venezuela through free and fair elections, with international monitors to ensure they are legitimate. "We support a constitutional roadmap that will support a peaceful, immediate, democratic transition through free, fair and transparent elections in Venezuela," said Peru's Minister of Foreign Affairs Nestor Francisco Popolizio Bardales. The group also urged the Maduro regime to restore full freedom of the press and end censorship of the media in Venezuela. That call came as both Venezuela and Russia called out Canada for denying media accreditation to state-owned media outlets from both countries seeking to attend the closing press conference of the Lima Group meeting in Ottawa. Venezuela's state owned media, teleSUR, posted a screen-capture image on Twitter of an email from Global Affairs Canada informing the outlet that it had not been accredited to attend media events surrounding the meeting. A Canadian government official speaking told CBC News that teleSUR was not granted access because it is a state-sponsored propaganda outlet. The Russian embassy in Ottawa issued a statement condemning the move, along with Canada's decision not to accredit Russian news outlets Sputnik, RIA and TASS. "Canada should stop restricting journalists from reporting freely without obstruction or reprisal and must apply to itself the same rules and standards it demands from others to follow," the statement said. President of the Canadian Parliamentary Press Gallery Philippe-Vincent Foisy, a Radio-Canada reporter, told CBC news that ITAR-TASS is an accredited member of the gallery and the failure to accredit the outlet was a source of concern. "The gallery will be seeking explanations from [Global Affairs Canada] to safeguard the access expected for gallery members. If ITAR-TASS was indeed denied accreditation ... it is problematic," he said. "I would note that Canada could set an example for all by embracing access to reporters even from state press agencies or others they don't necessarily agree with, as long as there are no security concerns." During the closing press conference, a small group of pro-Maduro protesters held up a banner and began chanting, "Hands off Venezuela," before being ushered from the room. Those protesters appeared to be wearing official media accreditation for the event. 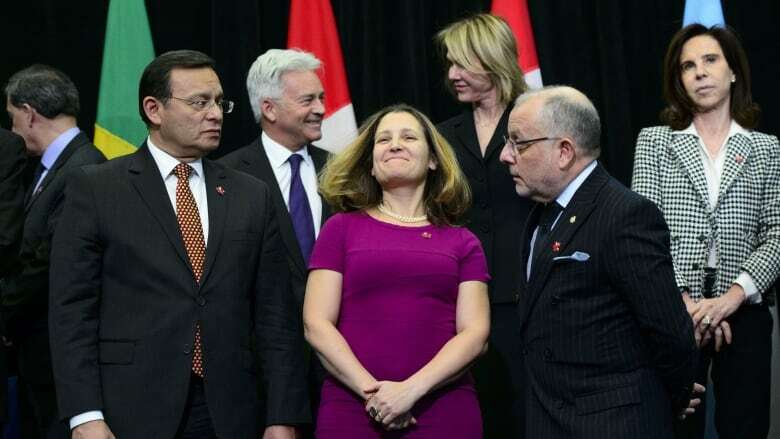 Once the protesters were removed, Freeland told reporters that Canada's support for Guaido, and that of the Lima Group, is a recognition in part of the right to democratic expression — including the right to protest. "The kind of democracy which political protesters in Canada do enjoy, and which I am sad to say political protesters in Venezuela do not," she said.